CAPTCHA cracked? Startup Vicarious claims artificial-intelligence breakthrough. 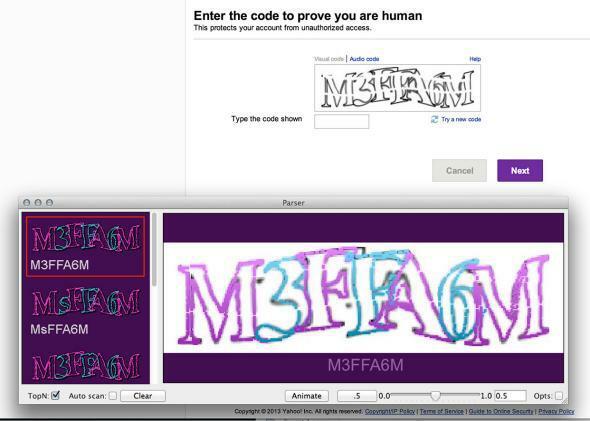 This screenshot shows Vicarious’s software parsing a CAPTCHA used by Yahoo to differentiate humans from bots. “The milestone is on par with Watson winning Jeopardy!,” D. Scott Phoenix told me in an initial press email teasing a breakthrough in artificial intelligence by his San Francisco-based startup, Vicarious. Whether the achievement lives up to that billing remains unclear. At the very least, it demonstrates that the company has big ambitions and a knack for PR. A CAPTCHA scheme is considered broken if an algorithm is able to reach a precision of at least 1 percent. By leveraging core insights from machine learning and neuroscience, the Vicarious AI achieves success rates up to 90 percent on modern CAPTCHAs from Google, Yahoo, PayPal, Captcha.com, and others. This advancement renders text-based CAPTCHAs no longer effective as a Turing test. There’s some debate, though, about just how big a deal this is. It’s not the first time a team of software engineers has claimed to have cracked CAPTCHA. CAPTCHA co-inventor Luis von Ahn told Scientific American he must have heard 50 such claims over the years. The question is whether Vicarious’s effort represents a serious leap over previous solutions, which tend to perform well at solving one or two particular varieties of CAPTCHA tests but break down when confronted with novel circumstances. While the approach employed by Vicarious represents the latest thinking in the field, von Ahn said, it’s hard to know just how well it works. That’s because Vicarious has elected not to publish its findings in any academic journal, preferring to keep its methods under wraps for the time being. I sent them CAPTCHAs off the internet. They were able to solve the first one, from a Paypal website, immediately. But the algorithm was stumped by two others. One had Cyrillic characters. “We haven’t trained our system on other languages yet,” said Phoenix. And it also failed on a CAPTCHA that used alternating patches of black and white like a chess board. It’s understandable that the software would be foiled by specific oddities of various CAPTCHA implementations. Then again, that’s exactly why CAPTCHA has proven so durable over the years—because it can be tweaked in all sorts of ways to befuddle even the most advanced general-purpose algorithms. The takeaway, for now, is that Vicarious may (or may not) have built the most adept CAPTCHA-cracking algorithm yet—but that it remains a long way from human-level intelligence, even in the constrained realm to which it has so far been applied. It may serve to hasten the decline of CAPTCHA across the Internet, but we needn’t fear a broader rise of the machines anytime soon.